Sony’s NEX compact camera system easily stands out among the brands of interchangeable lens systems. Unique signature design, APS-C sensor, minimal buttons. Sony took back some lessons from the first models and improved it in this latest edition, NEX-C3. Apart from the usual improvements to further reduce the physical size and increasing the sensor size, plus software enhancements, there is nothing to shout about for this model. Fortunately, Sony does not remove any signature features, like what some manufacturers did to their new models in a bid to segment their product line. Video Recording. If you shoot video regularly, the NEX-C3 will make you feel empowered. The weight distribution at the big lens means you get a more stable handling. The shortcut video recording button immediately starts recording, no matter what mode you are in – even during playback mode. During recording, you can adjust EV manually, another critical feature. Finally, you can re-focus manually during recording by half-pressing the shutter button. Unfortunately, all the button pressing and lens zooming sounds are captured on the recording, so you might want to keep the adjustments to a minimum while the tape is rolling. Custom Shortcut Keys. Sony NEX series have been criticised for having too few dials and buttons to allow quick changes of settings. To satisfy the advanced users, NEX-C3 allows users to customise 4 buttons: left, right, centre, and bottom. 3 of the buttons will invoke the specified functions immediately, while the centre button allows you to invoke the “custom” item which pulls out a list of 5 custom functions. With the custom shortcut keys, I can change ISO, drive mode, white balance, AF area in fewer presses. Nevertheless, some functions are not supported and you still need to look for them in the still-confusing menu categories. Aggressive Auto ISO. Sony is so confident with their high ISO quality that they have no qualms in auto-selecting high ISO levels like 1600. This allows me to capture less blurred shots indoors. Competitors cameras would cap shyly at ISO 800. Photo Creativity mode under iAuto. Again another trend, iAuto is no longer just full auto. In NEX-C3, users can invoke Photo Creativity to select multiple effects like “layers” to create your unique look. If only the layers can be saved as presets. External Flash. 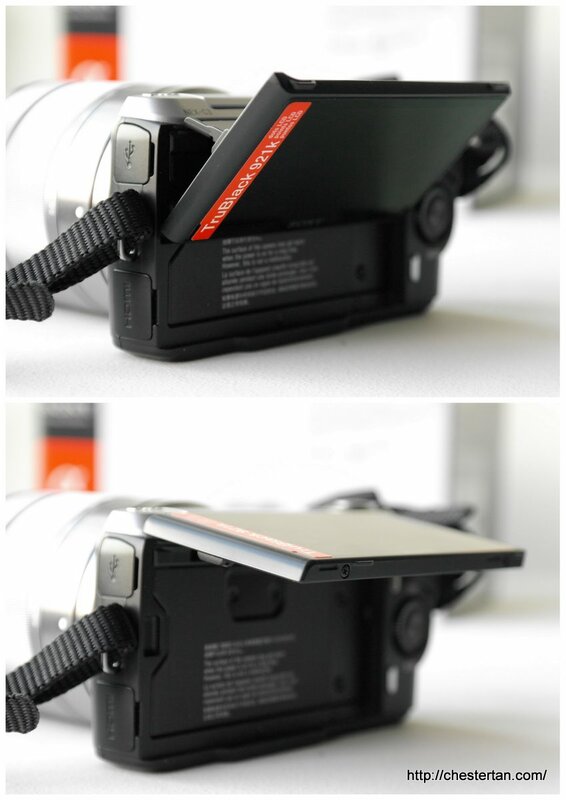 Sony’s solution to making the NEX body small and still offers flash is to bundle a removable flash unit. When not required, you can push the flash down to its “off” position. When required, you can flip up the flash manually and it will fire. This implementation allows you to leave the flash unit always mounted. With other cameras, you would have to remove and insert the flash unit frequently in between uses. LCD Screen. The NEX-C3 display stands out as sharp, clear and good contrast with 921K pixels. Images look cooler when compared with my computer monitor. Shutter Sound. Sony NEX series generate loud shutter sounds. I am certainly unable to shoot stealthily or use the continuous shooting mode for too long without provoking any irritation from people around me. The speed-priority continuous shutter mode is also very sensitive. I had to try very hard not to fire two frames by consciously lifting my finger off promptly. AF Area and Speed. Generally, the AF hunts quite a fair bit before locking focus, even if I was trying to re-focus the same scene. The Multi-AF Area is also picking obscure areas that I would like to shoot. Instead of selecting the “wrong” areas, the NEX-C3 would simply leave the AF Area to centre. It gives me the impression that it is not trying hard. Buffer. When shooting in RAW, the NEX-C3 has enough buffer only for 6 continuous shots. Therefore, this camera is certainly not for the trigger-happy desktop-processing enthusiasts. The Sony NEX-C3 is a welcome improvement on the NEX series without deviating from the objective of a consumer-friendly jargon-free camera. The body and lens are well-built, and I always appreciate the InfoLithium battery that tells the remaining battery capacity by the percentage. While I did not quite like the NEX-3 which I reviewed last year, the NEX-C3 is more accommodating to my needs, thanks to customisable buttons. I continue to be impressed by its low-noise high ISO handling, though its 18-55mm lens does exhibit chromatic aberration. If you need a compact camera that handles high ISO confidently, and have little concerns about swift manual controls, NEX is it.